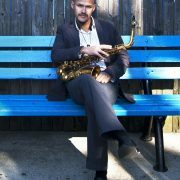 The Puerto Rican saxophonist says "What you do is about your work"
He exudes Caribbean warmth, but during the first minutes he looks reserved. He doesn’t feel comfortable walking in silence so he starts asking questions as a way to find something in common to talk about that eases the situation. One street and two corners are enough for that. Jesús Santandreu, a Spanish saxophone player, is the link. Then it seems that Miguel Zenón feels less strange talking with a stranger. They were classmates in Berklee so he has countless stories to tell as we stroll to the terrace for the interview before sound check at Jimmy Glass Jazz Bar. He’s not timid but he looks self-controlled, like if he needs to test who he has in front of him. And he opens up little by little. He is very polite and careful. The neatness that Zenón keeps in his hands is reflected on his facial expression, which communicates the same message as his words. This musician looks happy: his brand new project, Rayuela(Sunnyside), has already been launched in Europe. It will premiere in the United States on July 31. This new album is based on Julio Cortázar’s novel by the same name. It is one of Miguel Zenón favorite books and he has established, as in its pages, a Latin American and French connection through music with the pianist Laurent Coq. Who knows? Maybe Julio Cortázar would also enjoy Miguel Zenón’s music, as he did with Charlie Parker’s. This Puerto Rican saxophone player met the music in his childhood barrio. There was a local musician that gave free lessons when Zenón was very young. Then there was a band where talented children got to choose an instrument. Zenón first liked the piano but he realized that would be incompatible with a street band, so he chose the saxophone. Nothing serious, he claims, he liked it fine, but no more than he liked sports, for example. Music was a fun thing to do for him. How did you first come in contact with jazz? I discovered jazz through my school friends. They were a bit older than me and they used to talk about Charlie Parker, John Coltrane … And I think jazz was what made me fall in love with music. Because before that I liked music, but I didn’t take it seriously, and jazz just kind of sucked me in at some point. Was fusion your first major interest or did it come later for you? At the beginning I was interested in jazz exclusively, and I took it really seriously. The fusion and folklore thing came much later, when I already felt comfortable with tradition and the jazz language. And then I started to write my own music when I got interested in Puerto Rican traditional music, and from that moment on I began to look for ways of intertwining it with jazz. But I’m still in the middle of that learning process. What other kinds of world music do you like? Honestly, I like all folklore in general, from anywhere. Obviously, I’m more familiar with Latin American music, but I like that sensation of … I’m drawn to music that comes from common people. It’s a human good, that first reaction to music. Folk is music’s roots. Do you think that maybe this is because you first learned music in your childhood neighborhood? Yes, sure. In Puerto Rico, tradition is in the daily culture. And in that sense I always had it around me. And as years went by I began to understand it from a musician’s perspective, with a musician’s ear. It always has been there. With your music you give audiences a comprehensive lecture of all you have learned throughout the years and you translate it into your particular style of fusion. Where do you find that happy medium in order to remain loyal to the folk and jazz tradition? This is essential for anyone who wants to embrace creativity. I have always been pretty conservative when it comes to taking certain steps in this regard because there are certain basic elements you can’t get away from. In that sense I worked a lot on the elemental aspects of my instrument and jazz language. After that, personal expressions came in the mix and so I explored the possibility of finding new interpretational avenues. Your colleagues say you have a really good musical memory, that you can take a look at a score and you can remember it. So, is it visual or an auditory memory? [Laughs] That’s a bit of an exaggeration! Is not quite like that … And as far as your question I would said that it’s about 50-50. I think about the music as a series of events, but I don’t think about the score at all. I focus on some sections. With those events, more or less, I try to connect them with variations, and that’s my method for learning new things. You have played with Jeff Ballard and Antonio Sánchez, very different personalities. What does each one bring to your music? You are laughing. What did you do with Antonio in Berklee? [Laughs] No, no … I laugh because it seems like it was a long time ago! Antonio played at my graduation recital. So I’ve known him for many years now … Well, like I was saying, Antonio is like the drummer of all drummers, very technical, very clean with his instrument, a virtuoso … And Jeff is more like a musician that plays drums. I don’t know if you understand me. For him that is his instrument; he has something to express and drums are his way. Could you highlight one particular moment of your musical career? Honestly, there is not one particular moment I can choose. There are things that changed my life and led my way, like moving to the United States and studying at Berklee. There I met a lot of good friends and I was exposed to something I had never before seen in Puerto Rico: a real music scene. And I had the opportunity to connect with other musicians form around the world. And after that I decided to move to New York. It was the most significant thing for me as a musician because, probably, if I wouldn’t have moved to New York I wouldn’t be doing what I do now. It was something that guided me, and it helped me see myself inside the circuit and feel that I had something to give. Nowadays in New York there are musicians that have started playing in their own houses or in small clubs that are not on the jazz circuit. What do you think about this new tendency to create a parallel scene? I agree. 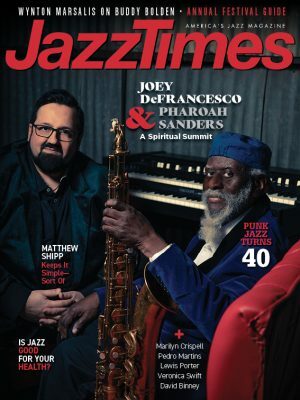 A lot of the conversations one hears these days don’t come from musicians necessarily; there are lots of people who write about jazz and that look at it from outside and they think about ways to make it more popular. The presence of jazz is being lost in popular culture, more and more as time goes by. How can we get it to come back? We have to go back to the roots, to the street, in order to bring jazz to the people … There is not just one single way to do this, there are many. You have two Grammy nominations. What do you think about these awards? To win a Grammy for me would be very positive in terms of promotion, and also just being nominated. But in musical terms it doesn’t make me a better musician; it doesn’t make me a bit better or worse. It gets people’s attention and in that way it’s very positive because it opens doors for people to know your music. But ultimately, what you do is about your work, not about an award. You are a founding member of the SFJAZZ Collective. How was this idea born? It was Randall Kline’s idea, and he was basically the founder of the San Francisco Jazz Festival. So it was because of him and because of Joshua Redman, who at that time was the musical director of the festival. They came up with this idea of doing a kind of band that was representative of jazz, but bringing in people from different generations and scenes who have a strong connection to the tradition. It was meant as a tribute band that at the same time creates new music. They thought about me and that was already eight years ago. I’m the only one that was there since the beginning, so we can say I’m the most experienced member, even I’m one of the youngest. You won the MacArthur Fellowship in 2008. You could have used that money for your own musical pursuits, but you preferred to develop a social project in Puerto Rico, Caravana Cultural. With this initiative you intend to bring jazz to rural areas in your home country. What’s your main objective? Well, the main idea is to minimize the business aspect of music, to go back to the roots and just play for fun. Obviously, music is my profession, but when I started playing it was because I genuinely enjoyed it, because I just wanted to play with my friends. So I try to go back to this feeling. It’s kind of informal because we go to the villages and we play there for all people; it’s an open thing. And the other objective is to bring more cultural activities to areas with limited cultural opportunities. We want to create cultural activities for the people there. There are people that have never listened to jazz in their whole lives. These concerts are kind of a tribute to a prominent figure in jazz history-Charlie Parker, Miles Davis, John Coltrane and Ornette Coleman so far. Before the concert we explain things about jazz and about these musicians. Next summer we’ll do a Duke Ellington concert and in the fall a Thelonious Monk one. So once the funds from this fellowship dry out, do you think there is any way to self-finance the project? Yes, now I’m thinking about how to continue with the idea. Maybe it won’t be exactly the same, because I probably won’t be able to bring musicians from the United States, but it could be done by Puerto Rican musicians. To keep bringing the music closer to the people, that’s the objective. And also to break away from this elitist conception of jazz. So, do you believe in music as a tool for change? Yes, I do believe it is. I feel it fills me up much more than other things, especially material things. So if that is my case, it can be the same for others also. What I have as a musician is what I try to offer. Sometimes I do it for money, as a job, but other times I devote my time, effort and creativity to making certain things happen.